As I have scrabbled through my cupboards bemoaning my lack of discipline, I have found quite a lot of gadgets which I have acquired over the years. Some were gifts, others were purchasing errors but some have real use. This burger press came to me as a present several years ago and has done sterling service and will continue to do so for many years to come. I dearly love a good quality beef burger but sadly they are not easy to find. I've often been appalled that the huge burger I put in the pan turns out to be a minute blob swimming in a sea of fat. That never happens with my home made ones. I buy "not more than 5%fat" mince and get to work with my press. 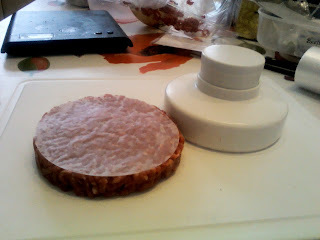 Really it isn't necessary to use a press - just pressing mince firmly with your hands will do - but as I have the press and I rather like using it, it gets used. If I became more limited for space it would probably go. Today 750 grammes of mince made six very generous burgers so they cost 84p each. Not the cheapest burgers but worth that to me. I pick my gadgets carefully and this is one I would pick. Some gadgets save very little time and effort. We have one of these and I love it because I love to make the patties and freeze them with waxed paper between them so I can just separate them and take out what I need -- definitely keeps me from wasting food! You lost your camera too? I keep misplacing mine as I carry it around the house to take pics of various things I am doing for all those riveting blogs I write! I have never taken a photo with my tablet -- I must try that! Camera now found - but a skill sort-of acquired with the tablet. I say sort of because I'm not sure if I could do it again! I shall find out when next I lose my camera - note I say "when I lose" not "if I lose".